Being a preschooler means days full of discovery every time you step out of your door. It s a time filled with wonder, at all the sights and sounds of the outdoors and at the huge variety of people there are to meet. This collection of nineteen original poems features little ones eager to explore, whether it s splashing in puddles, riding in an elevator or through a car wash, or visiting the library. They go full-steam ahead to the park, the beach, and dance class, somewhat begrudgingly learn to share and get their first haircut, and enjoy lots of time with their families. 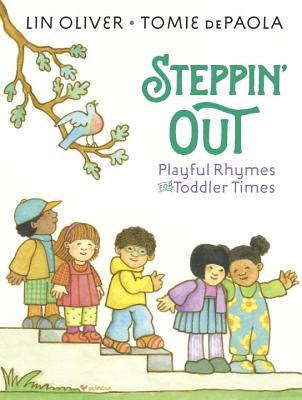 Full of contagious rhythm and rhyme, this inviting picture book introduces young children to the sounds of poetry through familiar childhood activities, and beloved illustrator Tomie dePaola's engaging children are the perfect match for Lin Oliver s bouncy poems." I have enjoyed DePaola's art and stories for years so I jumped at the chance to review this book even though I'm not much for poetry. But I do believe children should be exposed to poetry along with other forms of fiction and this seemed like a good book for my class of toddlers. The poems cover a range of mundane toddler activities - playing at the playground, going shopping, time with family, etc. Some of them are a little moralistic but gently so, more noticeable to adults than children. Some are bouncy, as the blur says, while others are quiet. The artwork is cheerful, detailed but not busy, charmingly complements the poems, and classic DePaola. As I typically do with print books, I took this to my classroom and read it with my kids. Sadly, it didn't hold their interest. I tried jumping around, skipping poems, but that didn't help. They liked the pictures, pointing out details that caught their attention, and asking to look at particular pages. There were a few poems they liked and wanted to hear the next time, but most of them were of little interest to the kids. Maybe it would work better with preschool children, three to five years old. By and large, it failed to hold the interest of my toddlers. Aw that's too bad it wasn't quite as successful as hoped.